The pate brisee recipe given here is perfect for most quiche and tart recipes. There are two versions, one savory and one slightly sweet. Both go together very quickly and are easy to work with. Making tart dough can be a frustrating experience without a good recipe and a few pointers. Hands get tired mixing ingredients and - grrrrrr - who wants to deal with sticky dough? Personally, I have always thought that a good way to save time and aggravation in the kitchen is to rely on store bought pastry crusts. It has been my good luck that here in France there is a vast selection of fairly good crusts in just about any grocery store. However, even when using a high quality product that contains few ingredients, there is always an industrial taste and smell that goes along with pre-fab tart crust. So . . . I am quite happy to find a very reliable and tasty tart and quiche crust recipe that does not leave me wanting to cuss out anyone who happens to be in the kitchen. By using a food processor and this pate brisee recipe, you can make a lovely tart shell with just 10 minutes of work. The ingredients for pate brisee and regular pie dough are basically the same. The difference lies in the mixing which then changes the end result. A tart crust made from pate brisee will be crispy rather than flakey. Frankly I think most people wouldn't notice much of a difference. The traditional way of mixing is of course with your hands. A pastry chef would just dump the ingredients on a clean working surface and mix them together expertly. He would rub the flour and butter together between his hands in a process called le sablage. After adding in the liquid he would then quickly push the dough with the heel of his hand to blend the butter with the other ingredients: le fraisage. 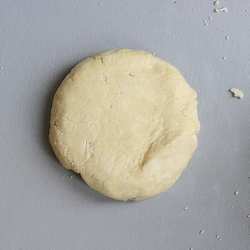 Although the butter and flour are supposed to end up intimately mixed together in a pate brisee, just as with pie crust, care must be taken not to overwork the dough. Using a food processor, as in the pate brisee recipe given here, assures that the blending is done quickly and without over warming the ingredients. You will find two recipes here: one unsweetened and one with just a little sugar. The unsweetened dough is perfect with most quiche recipes and savory tarts. The sweetened dough contains only a little sugar - just enough to make it the perfect holder for dessert tarts especially fruit tart recipes. Resting the dough. The dough should be allowed to rest in the refrigerator for at least 30 minutes before rolling it out. This time allows for the ingredients to get to know each other. Blind baking. If you intend to blind bake the crust, wrap the fitted tart pan in plastic wrap and freeze the crust for at least 30 minutes before placing in a preheated oven. This is the easiest way to keep the crust from slipping and shrinking. Freezing. You can freeze the dough at any stage in the process. If you freeze it in a unrolled out disc, count about 24 hours for it to unfreeze in the refrigerator. I like the convenience of freezing the crust fitted to the pan. This means that everything is ready to go when I want to start baking. Finally you can freeze a blind baked crust, but I can't see a reason for doing this. A freshly baked crust is always going to be tastier. Using a sharp knife, cut the butter into about 50 small pieces. Place the flour and salt in a food processor equipped with a blade and mix together - about 10 seconds. Add the butter and pulse on high in 1 second pulses until the mixture looks like coarse meal. For my food processor, this is 15 1 second pulses. I count. With the food processor running, immediately begin pouring the cold water in the chute. Stop the food processor as soon as the water is added and the dough begins to clump together. The whole process of adding the water takes less than 10 seconds. Turn the mixture out onto a clean surface and gather the dough into a ball. Flatten the ball into an even edged disc. Cover with plastic wrap and refrigerate for at least 30 minutes before rolling out and fitting to tart pan. To blind bake the crust, fit it to the tart pan, wrap in plastic wrap, and place in the freezer for at least 30 minutes. Preheat oven to 200°C and bake for 15 minutes or until golden. If you are going to bake the crust further with ingredients in it (as for a quiche recipe), just bake for 12 minutes. Add two tablespoons of sugar in with the flour and salt. Otherwise the recipe is exactly the same. Return from French pate brisee to to French pastry recipes.